After quite a traumatic experience for poor Bluebell Flora, I’ve just uploaded Breezy Boudoir to the Exchange. She was busy painting away when a little pop-up appeared telling her it was getting a bit dark. I had no idea what this meant until a bloody great big meteor landed on top of her. So in true Sims style I deleted the lot and plonked down my backup from the Library so I could continue CASing and hanging paintings. Previous It’s official. For all Mac users – Cider is CRAP. Next Round 2 of EA’s incompetency when it comes to Macs. this is the most beautiful house i have seen! its too bad for your sim! i have never had that happened to me! 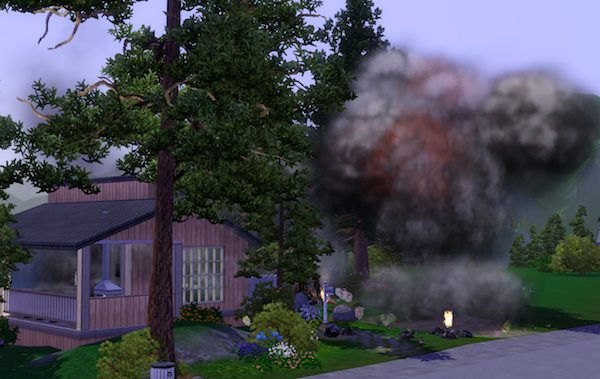 If your sim is carryon a Death Flower at the time of the meteor hit, there is a good chance the Grimmy will be so overwhelmed by the gift that he will bring your Sim back to life…That’s what happened to my sim, anyway! So now I try to make sure all my Sims are carrying a death flower at all times! Absolutely lovely house, by the way…as usual! Thank you for the lovely compliment about the house Sacharissa. Very nice house. Pity about the meteor. I had one hit the house as my sim was moving in at the start of a new game. Only time I’ve had meteor strike too! I was too scared to continue in case things went downhill from there!